You know a full-blown mania exists when adults revert to childhood and do things no rational grownup would do. "Irrational exuberance" it's called, when market actions are involved, whether buying a house in Hawaii for $1.2 mil (we all know that right-priced, it would be $600,000) or being the last to jump into the stock market. 609 Kailua Road (next to Cold Stone Creamery, in the former Longs Drug Store). Call 263-6636. When it comes to indulging in personal manias, the term "second childhood" comes to mind, and would go a long way in describing fans of Korean dramas, including men in hot pursuit of the authentic Korean charcoal grill experience -- deemed necessary not for sustenance or to satisfy a craving, but for "living the life." I shall not name names, but you know who you are. Such romanticizing of Old World cuisines can only happen in the New World. As we cling to the flavors and textures of meals as made by our grandmothers, passed on to them by their mothers, we assume tradition is equally foremost in the dishes' countries of origin. But, there's no stopping evolution. Like any living, breathing entity, food evolves. Taste evolves, subject to the constant influx of ingredients and ever-increasing exchange of ideas. So, prepare for an era of Korean fusion, as introduced by Hojin Song. After running three successful restaurants in Guam and Micronesia, the Korean native has arrived to present simple, fast Korean fare with an emphasis on health. 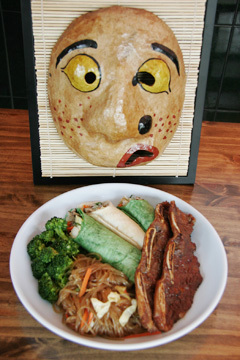 Veggie ssam and galbi are served at HoJin Korean Fusion, in front of a rice-paper mask made by the owner. Fusion cuisine is always scary because most people like their food familiar. It's the reason locals never outgrow a love for Spam. Song keeps his menu simple enough so as not to frighten anyone, and "fusion" largely means bringing in local-style dishes of sweet-and-sour chicken, long beans with shrimp and honey chicken wings to supplement the roster of neo-Korean dishes. It also means giving a healthy twist to Korean standards, so "ssam," usually comprising grilled beef or pork rolled in lettuce and sesame leaves, are now veggie rolls of seasoned tofu, egg whites and fresh sliced carrots, cucumbers and greens, served in a flour crepe. The cost is $6.99 for a plate of two ssams plus two vegetable choices. The ssams also sell for $1.50 each a la carte. Mandoo ($2.50 for five or $4.75 for 10), filled with tofu, greens and very little pork, is uncustomarily light and fresh after only a brief encounter with hot oil. To cut fat, you can also ask to have them steamed. Located in one of the new spaces created out of the former Longs Drug Store building, the space is immaculate. It gives the food sitting at the counter a tidy, cold, sterile look that isn't as appetizing as the messy, colorful mounds of kim chee, shoyu potatoes and "namul" presented at other fast-food outlets. But looks can be deceiving. The clean look carries into spicy squid and "japche" (stir-fried glass noodles) that have all the integrity of dishes prepared fresh. Nothing is too oily, greasy, overcooked, dry or otherwise compromised. 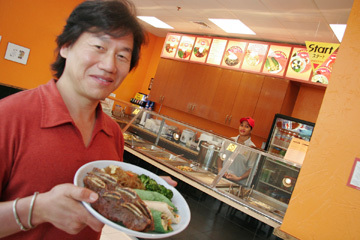 You can create a mixed plate for $4.99 (entree, two salads, white or brown rice) to $6.99 (two salads, three entrees). Not to be missed is the "yook gae jang" ($6.99), spicy soup of beef, vegetables and long rice. And about those spellings, Song wants to set the record straight, saying that the familiar "k" in front of kalbi and kim chee is really pronounced with a softer "g" sound, making them "galbi" and "gimchi" on his menu. So get used to it. You do want to live the life, right? Hojin Song has remade traditional dishes with good health in mind.